India is blessed with beautiful beaches with cool and serene surroundings which are the perfect destination for beaches lovers. 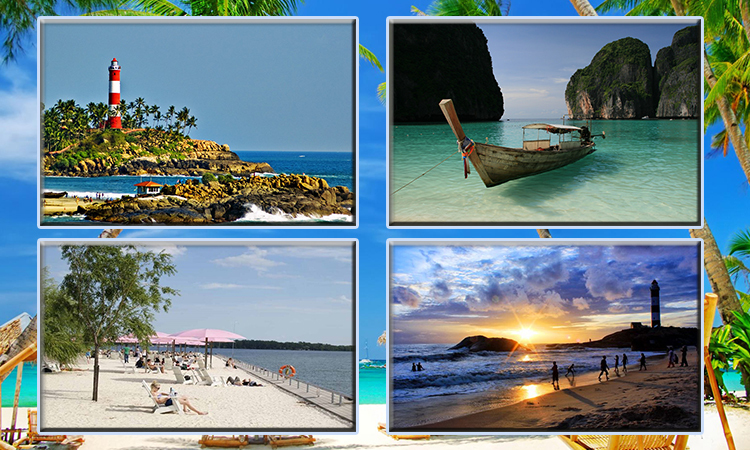 There are many beaches destinations in India where you can enjoy sunrays, sparkling sand, sea, and breeze. Blood Pressure also reduces from the salt of the Beaches. You can feel free to visit the beaches and also enjoy food, drink, tanning, massages and other water sports fishing etc. Here are some best beach holiday destinations in India. Goa: Goa is the perfect destination to explore beaches in India. This is the state where you can see the mesmerizing view of the sunbathing, parasailing or relax in hammocks. Goa is very well known for the New year party at the Candolim beach, late night parties, vibrant music and dance. There is the number of beaches like Calangute, Anjuna and Baga are the famous for the parties on the seaside. At the Goa beaches, you can enjoy serene and peaceful surroundings and seashores are worth with Goa beaches. Here you can also do the adventurous activities like parasailing, surfing or waterboarding in the sea. Kovalam: Kovalam is the rejuvenating beach holiday destination in Kerala district of India which is most visited by the tourist. There is a beautiful view of the coconut trees. It is also the affordable family beach vacations in Kovalam. Here Lighthouse beaches offer watersports and beach activities and Hawa Beach is popular for photogenic sunsets and sunrises. Here you can enjoy the activities Paragliding, Surfing, Parasailing, sunbathing and riding Catamarans. Pondicherry: When you are getting frustrated with your daily life routine, you can take the break, get refresh and rejuvenate yourself with Puducherry beach destinations. It is also known for the meditation and relaxation and it is also famous as India’s French collection and Sri Aurobindo Ashram. Here you can enjoy the activities like camping at the beach, Sunbathing, canoeing, kayaking and backwater sailing. Andaman: Andaman is the popular destination for the family beach vacations. It is popular Radhanagar Beach which has been ranked as World’s 7th best beach by the Time Magazine and also famous for White Sand Beach, also known as Beach No 7 of Havelock Island. The activities here you can do are Scuba diving, snorkeling, sunbathing, swimming and game fishing. Mangalore: Mangalore is an Arabian Sea port and most popular beach destination in India. It is situated in the Karnataka state and famous for the Temples, Bronze statues, and Beaches. It is famous for the Tannirbhavi Beach which is popular for sunset views and also famous for Panambur beach where you can enjoy the activities Jet ski rides, Boating, Dolphin viewing, and skiing. Jaipur Car Rental provides you great opportunity to take Best Tour Packages like Golden Triangle Tour Packages, Rajasthan Tour Packages and Same Day Tour Packages with best Car Rental Services like luxury Car Rental Services with private car driver and tour guides. So grab the opportunity and enjoy your trip and make it memorable.